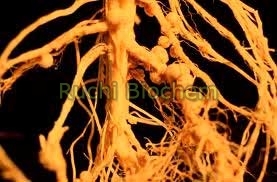 Nitrogen fixing Bacteria for Leguminous Crops Rhizobium fertilizer contains Rhizobium micro-organisms. These micro-organisms live in association with the roots of leguminous plants in the form of root nodules. These micro-organisms fix the atmospheric Nitrogen in the roots & make it available to plants, which plants can't fix directly and makes the soil fertile & also increases the plant health.